It’s that time of the year again where most of the shops in Singapore will be closed for business on the first two days of Chinese New Year and you are stuck at home not knowing what to do. Why not Netflix & Chillax with these shows and movies that we had curated by the team at superadrianme.com and have a wonderful time bonding time with your family and friends over popcorns and TV. If you are a fan of the Cloverfield series of movies, this will be a great movie pick for this weekend. It is the third installment in the Cloverfield franchise, following Cloverfield (2008) and 10 Cloverfield Lane (2016). The story follows an international group of astronauts aboard a space station who, after using a particle accelerator to try to solve Earth’s energy crisis, must find a way home after accidentally traveling to an alternate dimension. All hell break loose when the accelerator was activated. This is the prequel to Cloverfield in 2008 and it stars Daniel Brühl, Elizabeth Debicki, Aksel Hennie, Gugu Mbatha-Raw, Chris O’Dowd, John Ortiz, David Oyelowo, Zhang Ziyi and produced by J. J. Abrams’s Bad Robot Productions. Let’s put the GAY and QUEER out of the equation. This reality makeover series hosted by five SNAG (Sensitive New Age Guy) have set the benchmark high for future makeover reality shows. More than just a simple wardrobe makeover and home refurnishing. The Fab 5 specialists will always try to create opportunity to make small talks with their heterosexual “patients” to find out the emotional wall and regards which land them to their current state. Because a makeover will never be complete without a makeover on that individual’s soul. Just get ready a box of tissue when you watch Queer Eye. During CNY, most of us will be presented with tons of opportunities to gamble. That may be the start of a gamble addiction. FEAR NOT!!! We have Kakegurui to help save the day… maybe… hahaha. Hyakkaou Private Academy houses the most wealthy and privileged students in Japan, with many future leaders and professionals among the student body. In the school, the student hierarchy is determined by an intricate gambling system in which students bet their fortunes against one another. Though this anime series, one might see the crazy ugly side of compulsive gambling and might just kicked that gambling addiction before it even start. Korean superstar, Lee Hyo-Ri, opened her home to be a Bed & Breakfast for this reality TV series. The series shows the intimate and lovey dovey moments of Hyori and her hubby, Lee Sang Soon, in their cosy house on Jeju Island. Another superstar, IU, will be seen in the show as the helper to the couple to operate the B&B when guests come over to stay. After watching this series, some may enyy Hyori’s courage to take a hiatus at the peak of her career to lead a peaceful and quiet life in Jeju Island with her husband. This 16 episode series depicts the story of prisoners and staff at a prison. Je-Hyeok (Park Hae-Soo) is the best relief pitcher in Korea. He will go to the U.S. and sign a contract with a major league team. One night, he hears his sister screaming and sees a man running out of her apartment. Je-Hyeok and the man get into a physical struggle with Je-Hyeok striking the man with a rock. Later, Je-Hyeok receives a 1 year prison sentence for using excessive force. Devastated, Je-Hyeok must adapt to life in prison. Meanwhile, Joon-Ho (Jung Kyoung-Ho) is a friend of Je-Hyeok and works in the prison as an officer. He waits for Je-Hyeok’s arrival. Only available from 19 February 2018, Fullmetal Alchemist live action movie is about the journey of alchemist Edward Elric searches for a way to restore his brother AI’s body and his encounters with the military government and mysterious monsters. 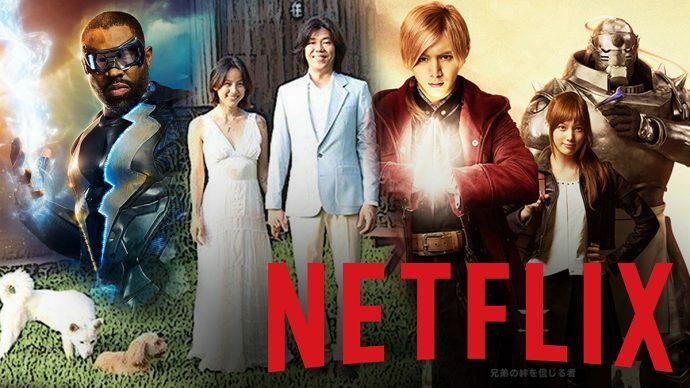 Adapted from the popular manga series, the 2017 Fullmetal Alchemist live action movie have been of great anticipation by fans around the world and now in less than a year, its finally coming to Netflix Singapore. It may not be in time for the long weekend, but it is worth putting it on your wait list. An ongoing series in the USA, Netflix Singapore will be airing new episodes of DC Comic’s Black Lightning series very Tuesday one week after it airs on The CW in the USA. The story starts with Jefferson Pierce, who retired from his superhero persona Black Lightning nine years ago after seeing the effects it had on his family, is forced to become a vigilante again when the rise of the local gang called the 100 leads to increased crime and corruption in his community of Freeland. If you like Marvel’s Daredevil series on Netflix, Black Lightning may be the next series for you with a similar dark plot and finding balance between serving justice and keeping everyone around him safe.